While we humans experience seasonal allergies particularly during the onset of spring, we often forget allergic reactions affect our pets as well and springtime is definitely a bad time for dog allergies! Many such reactions in dogs manifest as itchy skin. In addition, the skin becomes dry, flaky and develops red welts. In many severe cases, open sores may develop. Seasonal allergies in dogs are a serious concern for many pet owners. 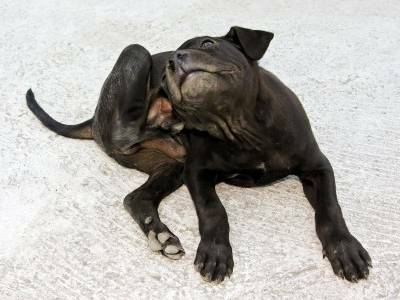 The discomfort from constantly scratching itchy skin is exacerbated if the dog begins to chew and lick the affected areas. The skin can lacerate and bacteria can enter the body through the laceration. In many severe cases, this can result in a serious internal bacterial infection that can result in death if left untreated. For those who live in humid climates, seasonal allergies are compounded by flea infestations. Many pets are allergic to fleas. This allergic reaction can be severe and debilitating. Many veterinarians recommend a heartworm preventative medicine that also contains medicine that kills fleas. In addition to this treatment, it is also recommended to use pet products such as shampoo that is specifically formulated for skin conditions. Many dogs will develop “hotspots” on their legs, paws, and tail area. These hotspots are red welts that may become open sores if left untreated. The hotspots are caused when the dog attempts to relieve the itching by nibbling the area with its teeth. In addition, the animal will lick the area excessively creating a comfortable home for bacteria to grow. Earthbath is available in a variety of healing shampoos. However, if you have a dog that suffers with itchy skin due to seasonal allergies, this is an amazing product. After just one use, you will notice your pet is scratching less. This remarkable shampoo does not contain harsh chemicals. The product will clean the skin and hair while maintaining moisture to combat dryness. It will instantly calm inflammation to relieve the itch and redness. Important Note:This product is specifically formulated for dogs and should never be use on cats as it contains Tea Tree Oil. If your dog has severe seasonal allergies that result in red itchy skin, you can provide relief with this medicated spray. While a specially formulated shampoo is a wonderful choice, let’s face it, you are not going to be able to bathe your pet every day. In between baths, this spray will provide relief while preventing bacteria or fungal infections. The product will soothe and moisturize the skin with aloe and lanolin. In addition, this product is formulated for sensitive skin but can be used on all skin types. This consumer recommended supplement is a wonderful way to combat the symptoms of seasonal allergies. It contains a Nettle Leaf, which is widely used in Europe and Asia to control histamine levels. This product contains natural ingredients that help support the immune system. This supplement can be used in combination with allergy relief shampoos to help your pet stay healthy and comfortable. Remarkably, this supplement is affordable at a price under $13 for 60 tablets. For immediate relief of raw, itchy skin, this hot spot spray is fantastic. Many dogs suffer with red hotspots that often develop into open sores. At the first sign of redness or irritation, you can provide immediate relief for your pet. The spray will relieve the itching and prevent the hotspot from becoming an open sore. You simply spray it on as needed to prevent your pet from gnawing at the affected area. This alcohol-free product will not cause a stinging sensation nor will it dry out the skin. Keep your pets healthy and minimize the effects of dog allergies by selecting products formulated to provide relief against itchy skin.